Operation Tiny Home is proud to be the official charity organization of the 2017 National Tiny House & Simple Living Jamboree! 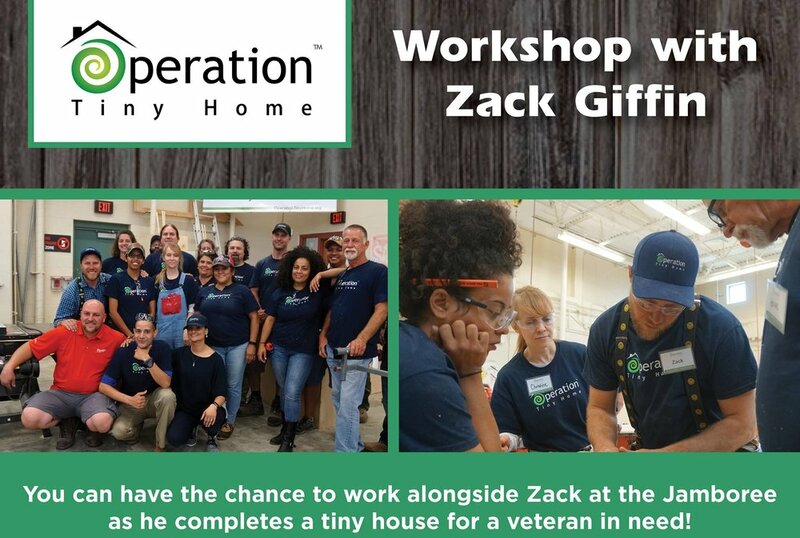 Don't miss the chance to work along side Zack Giffin, Tiny Home Specialist and co-host of FYI’s TV Show, Tiny House Nation, to learn convertible furniture and finish carpentry techniques while helping to complete a tiny home for a veteran in need. After the event, Operation Tiny Home will donate the finished tiny home to Farmers Assisting Returning Military - F.A.R.M. F.A.R.M. helps veterans in their transition from military to civilian life by providing a new mission and purpose for veterans through an immersive internship program, allowing them to continue their commitment of serving their country, by feeding their country. As veterans progress through the healing process of their program, a new generation of sustainable farmers is grown to replenish an aging farm community entering retirement. Immerse yourself in a day of woodworking with the guidance of professional craftsman, Zack Giffin, in this once in a lifetime opportunity. To ensure that as many people as possible can contribute, we ask that each person only register in one workshop during the Jamboree, so take a look below and make sure to pick your favorite day! *All proceeds support the Building A Better Future For Veterans Program. Operation Tiny Home partner, Michelle Wunder of Tiny Homes of Oklahoma will join Zack & John in guiding us through the techniques used to char wood, based on the traditional Japanese technique called Shou Sugi Ban. Farmers in Japan discovered many centuries ago that the burning of the outer surface of their cedar wood barns had a preservation effect, making the wood more resistant to weather and insects. Recently, this artistic and unique finish has increased in popularity for both its aesthetic virtues and its green nature. Carpenters and home DIY enthusiast most often use the Shou Sugi Ban technique for residential siding, fencing, and decking projects. This very sustainable, no-VOC method of finishing timber not only enhances the wood's durability, but also brings out its inherent beauty and character in a striking new way. Operation Tiny Home is a class act that exceeded all my expectations. David and I can’t say enough good things. We are still talking about it.